Betty J. Baringer BERLIN CENTER – Funeral services will be held at 11 a.m. Friday at the Lane Funeral Home, Austintown Chapel, for Betty J. Baringer, 86, who died Monday afternoon at St. Elizabeth Health Center after suffering a heart attack Thursday. Betty was born April 24, 1924, in Patmos, the daughter of Henry and Jane (Taylor) Kale and was a lifelong area resident. Betty worked as a press operator making canteens during World War II, for the Strong Manufacturing Company in Sebring. Betty enjoyed cooking, baking, gardening, roller skating, and being the boss. She was a great homemaker. She loved her children, grandchildren and great-grandchildren. She was a Betty Boop fan and collector, and loved new cars, especially convertibles. She loved to decorate her home for all holidays. 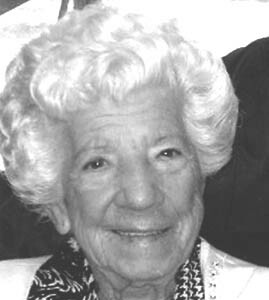 Betty was a life member of American Legion Post 377 and VFW Post 9571 Auxiliary. She graduated from Berlin Center High School in 1943, where she was a cheerleader for four years. Betty is survived by her husband of 64 years, Randall W., whom she married May 1, 1946; children, Don (Lori) Baringer of Sun City, Calif., Sheila (Jim) Gilmartin of Berlin Center and Debbie Centofanti of Youngstown. She is also survived by grandchildren, Chad, Ryan, Jason (Erika), Desirae (Paul), Doug (Jenny), Candy (Jimmy), Brent, Nicole, Joe, David, Dan (Bre) and Steve; and great-grandchildren, Gabrielle, Kendall, Delaney, Hunter, Madilynn, Taylor, Tyler, Austin, Gwendolynne and Brooklynn; a sister, Violet Eckis of Berlin Center; and brothers, Henry Kale of Salem and Press Kale of Buena Park, Calif. She was preceded in death by her parents. The family would like to thank the sixth floor of St. Elizabeth Health Center for all their love and care with Betty. Please share your memories of Betty Jane.